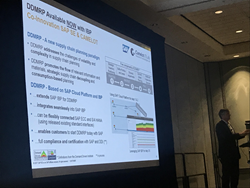 Camelot Innovative Technologies Lab Inc. (Camelot ITLab) today announced the co-innovation of the worldwide first enhancement app for SAP® Integrated Business Planning, the new cloud solution for real-time supply chain planning. Camelot Innovative Technologies Lab GmbH (Camelot ITLab) today announced the co-innovation of the worldwide first enhancement app for SAP® Integrated Business Planning, the new cloud solution for real-time supply chain planning. Camelot’s DDMRP for SAP Integrated Business Planning helps customers to implement the new Supply Chain Management (SCM) concept “Demand-Driven Material Requirements Planning (DDMRP)” and thus move into the new Demand-Driven Adaptive Supply Chain Model. With DDMRP for SAP Integrated Business Planning, Camelot aims to help customers benefit from dramatically improved customer service, increased supply chain agility and significant cost reductions. “At Camelot we have observed an increasing customer demand for the new FLOW-oriented Demand-Driven Material Requirements Planning approach, and we started early to transfer this revolutionary SCM ‘thoughtware’ into supply chain planning software,” said Dr. Josef Packowski, CEO of Camelot Consulting Group. Last year, Camelot developed the first SAP software–based DDMRP solution in SAP Supply Chain Management, which is also the first solution based on SAP software that is officially certified by the Demand Driven Institute, the global authority for Demand-Driven MRP. “With the co-innovated DDMRP enhancement for SAP Integrated Business Planning, we transfer the DDMRP concept into the new SAP Integrated Business Planning solution and thus continue to establish the Demand-Driven Supply Chain Management concepts within our mutual customer base,” he explained. DDMRP for SAP Integrated Business Planning enhances the SAP software with the functionalities of Demand-Driven Material Requirements Planning. The solution is part of Camelot’s Demand-Driven LEAN Planning Suite, the only SAP-certified software solution for Demand-Driven Supply Chain Management. Clients can benefit from significantly improved customer service levels and an increased agility through supply lead time compression by up to 50%. This results typically in 40% less inventory and reduced costs. Camelot Innovative Technologies Lab Inc. (Camelot ITLab) is the leading SAP consultancy for digital value chain management. With more than 20 years of experience Camelot ITLab leads clients in their digital transformation. Our capabilities range from the strategic dialogue around current challenges in the digital world to the implementation of the new, digital solutions. As part of CAMELOT Group with 1,600 employees worldwide, Camelot ITLab stands for customer orientation, innovation, highest quality and feasible end-to-end solutions. From innovations to solutions.